CHILD CARE CENTRE DISCUSSED – City planner Mike Ellis discusses the proposed child care centre during Monday evening’s city council meeting. City staff are recommending that council move forward to the final two readings of a zoning amendment that would allow a child care centre to be located inside the Days Inn hotel on Second Avenue. Joy Agus, who owns and operates two other daycares in the city, is looking to open the daycare centre inside the former Trappers night club of the hotel, which used to be the Westmark Klondike Inn. The plans would see an outdoor play space built for the daycare’s youngest charges, with older kids having outdoor time at local parks. They could either walk to parks or be transported via a passenger van the daycare owns. 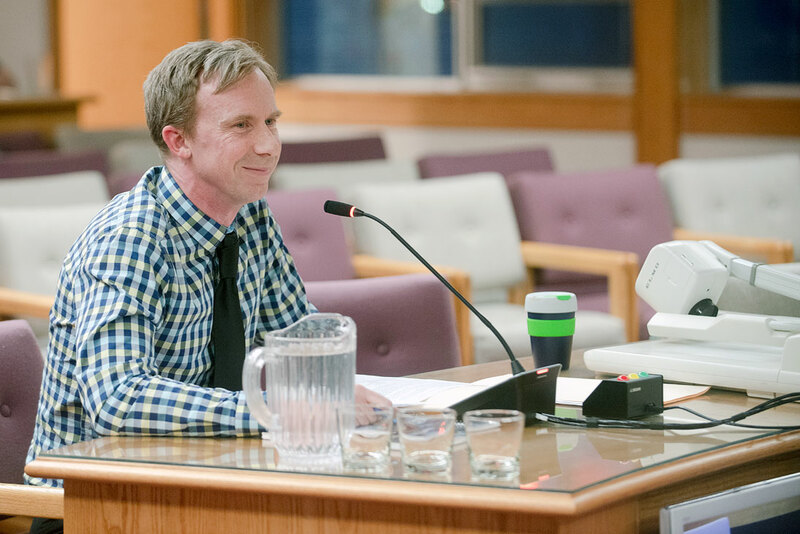 At Monday evening’s council meeting, city planner Mike Ellis brought forward a report on the public hearing for the zoning change held last month. There, concerns were raised by a member of the Network for Health Early Human Development Yukon about traffic and the argued inadequacy of the outdoor play area. Support for the rezoning was also expressed by Agus and another delegate who noted the opportunities for children to learn about safety as they walk to various parks and public spaces. The city also received four written submissions expressing support, given the proximity to the downtown where many parents work, and cost savings that come with a larger operation space. Supporters also said the issues around outdoor access can be dealt with, and the building would be renovated into suitable quarters for child care. First noting the potential increase in traffic, Ellis confirmed that the access to the daycare from Fourth Avenue would be for right turns only. With another access from Second Avenue, it was confirmed at the development review committee (which happens prior to zoning changes coming forward to council) that it’s sufficient to handle the additional traffic. Questioned by Coun. Laura Cabott, Ellis later confirmed that signs would be put in place to let drivers know that it is a right-in-and-out access. Ellis also addressed the concerns around the outdoor space. The zoning bylaw requires child care centres to provide access to outdoor space that’s at least five square metres per child that is “suitably landscaped, shaped and located,” he noted. The space proposed in the application would be a fenced area of 56 square metres next to the southern wall of the building, surfaced with turf and sand. It meets the requirements of the bylaw, Ellis said, noting Agus has also reported being in talks with hotel management about using a larger 80-square-metre fenced area. He pointed out that the plans for older children to go to local parks also fit with the bylaw. A number of child care centres in the city are without outdoor play spaces on their properties, using nearby parks and playgrounds for outside time. “Per the zoning bylaw, off-site play areas may also be considered, but must be within reasonable walking distance for the age groups involved,” he said. “A distance of 400 m is determined to be an approximate five-minute walk and is often used in urban design and transit planning. This is likely suitable for older children attending the child care centre. The issue around outdoor space prompted discussion among council. Coun. Dan Boyd pointed out that the proposed space at the daycare will be quite narrow. He suggested the city would do well to have more detailed written standards for outdoor space at childcare centres. Cabott noted that while Shipyards Park may be a five-minute walk from the proposed daycare for most adults, that’s not likely the case for a group of children. It would likely take longer, she suggested. She then questioned whether the van is to be used just by this daycare or all three daycares that would be operated by Agus. Ellis said he would have to get back to council with an answer to that ahead of next week’s meeting. It was also pointed out that there are limited properties downtown with attached outdoor play space. “A change in regulations to require additional on-site play area may reduce the number of successful applications for child care centres,” Ellis said. Council will vote on the final two readings of the rezoning next week.